Perspective. Important to keep things in perspective. I try to tell myself this from time to time. During petty squabbles with the small minded and unreasonable or during major sporting events etc. I don't want anything to completely rule my life either. There is so much to enjoy. Diversity. This story starts on the beach at Thurstaston and finishes at a similar venue in Norway. 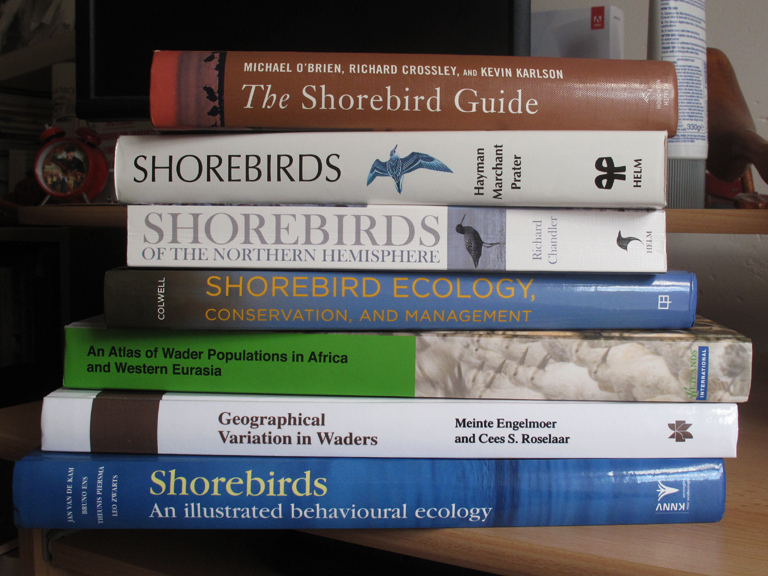 My study of migratory shorebirds is probably as close to obsession as I come, I find it and them fascinating and inspiring. 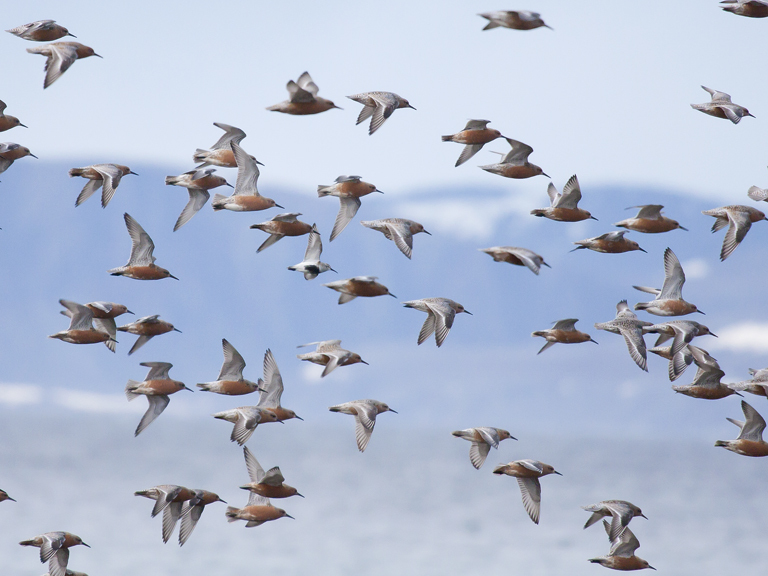 It's the 2nd of February and I am looking at a small group of Knot feeding on the pebbley edge of the mudflats at Thurstaston. There are only about 40, the main group is much further out. 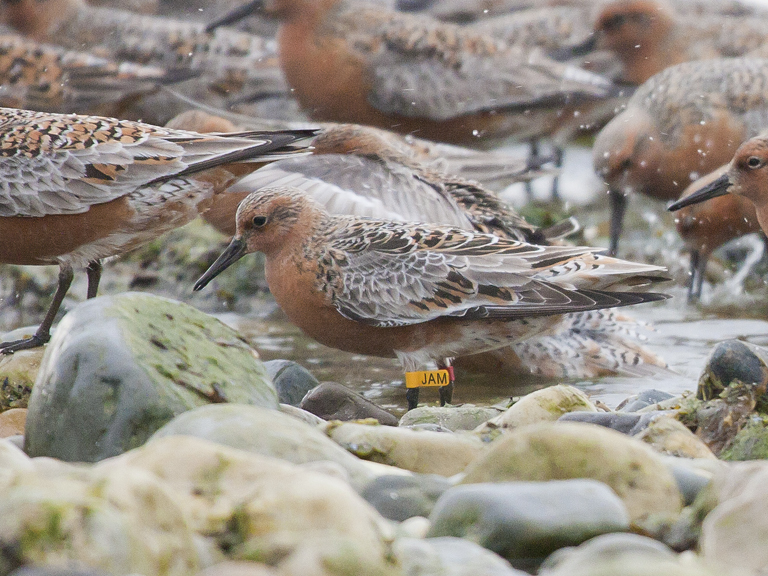 One of the 40 is ringed. A Norwegian bird (there are Dutch ringed birds wintering here too) with a red ring and a flagged yellow ring with 3 engraved letters. After a few minutes of careful scanning of the feeding frenzy I isolate the ringed bird and read the letters ELY. The code is noted and later emailed to project co-ordinator Jim in Norway. Jump forward to the 25th of May and I'm in Porsanger, thousands of miles away from my beach. 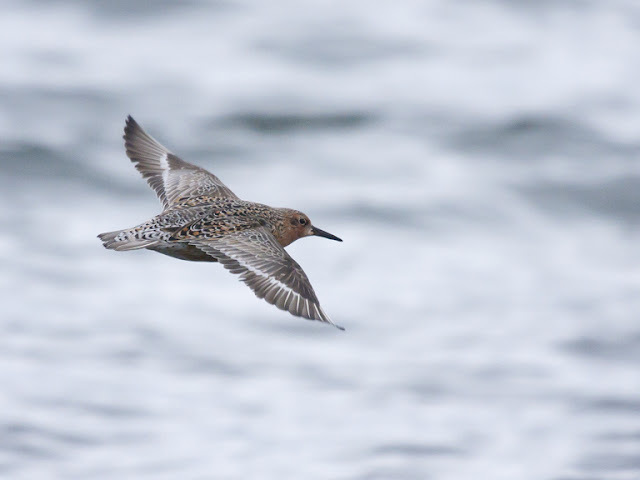 Jim had offered me a place on his 2012 expedition and I'm surrounded by Knots. 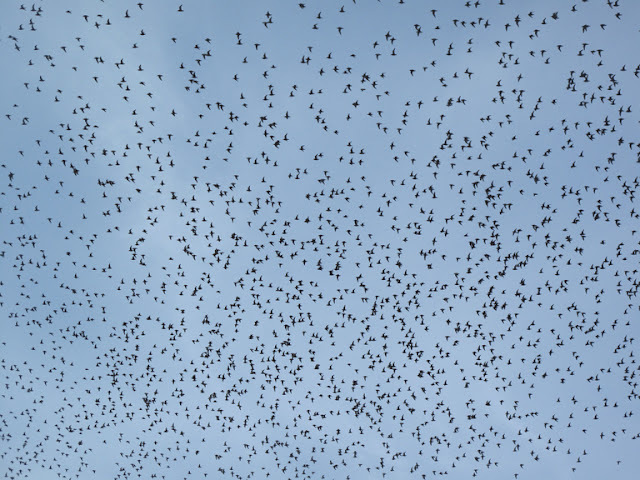 40,000 are flying around overhead making a ceiling of Knot. Breathtaking. 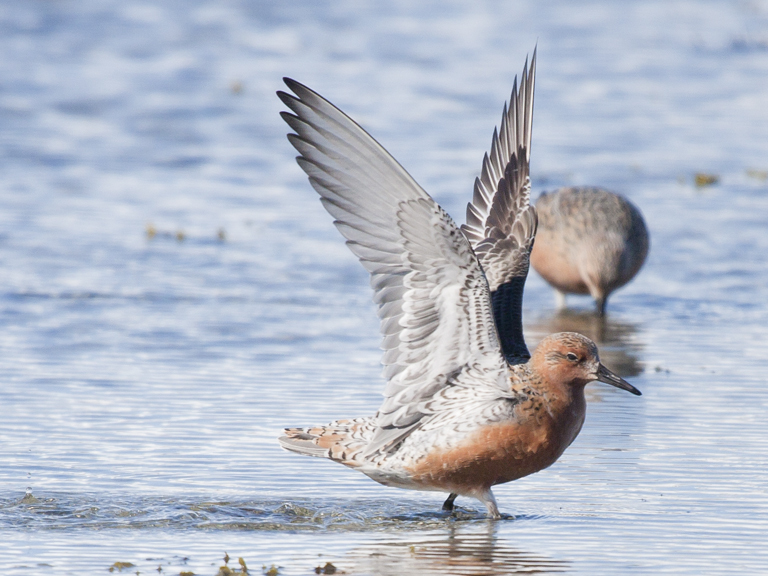 I'm helping to collect data for Jim's project looking at the migration ecology of the Knots staging in Porsanger. From here the birds will make a huge flight over open ocean to eastern Greenland and the high arctic tip of Canada. The birds are preparing for this journey. Feeding, washing and preening. This is as far north as I've been, the birds are looking further north again. This is one of my favourite pictures of the trip. One bird looking north. It knows what it must do and it is preparing accordingly. I stare at this picture for ages. I am beginning to understand the ecology behind this birds life and it transforms what I see. I feel my perspective shift slightly. 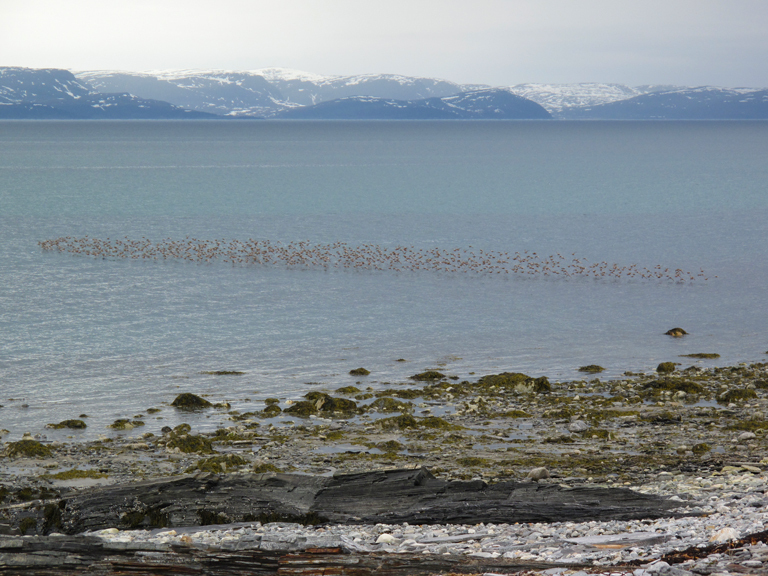 A flock flies in from further up the fjord. Back to the science then. I put my eye to the telescope and search the group for ringed birds. The ceiling is now a red carpet of Knot. After a short while I catch a glimpse of a yellow flag and lock on. It rushes through the seaweed strewn pools, showing its ring in flashes, instants too short for me to read the letters. I have learned patience during ring reading. Recorder effort will be rewarded. 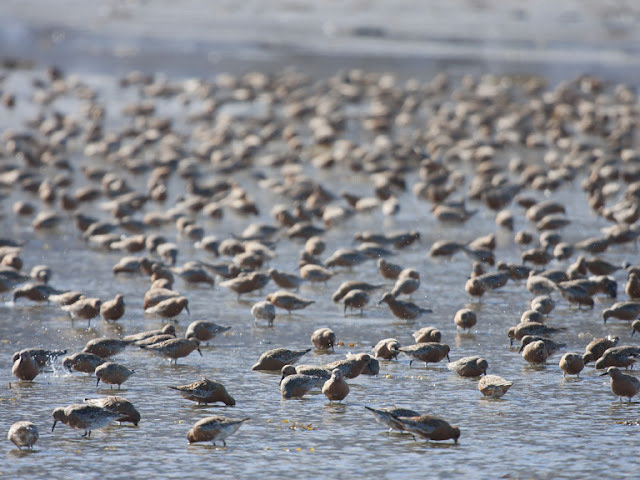 Besides I can think of no better way to pass the time than to be sharing an icy cold pool of salty water with a bunch of Knots. Perspective is getting slightly more skewed. Eventually patience is rewarded and the flock exit the water and I see the ring clearly and read the code. JAM. The birds are spooked and take to the air. A false alarm, but they take no chances. They soon settle and I go back to my search. An occasional flight is no bad thing, it mixes up the flock and gives me a chance to inspect more legs for rings. A few more wing it in and join the assmebled feeders. It is now that I lose a lot of the perspective I have tried for years to keep. I find another ringed bird in the flock and start to follow it. Every record is vital and I've got a fair few already but I want more! My target wanders out from behind a rock that looks like it is wearing a wig of seaweed. I adjust the focus and the letters resolve as my perspective dissolves. First letter E, second letter L, final letter Y. 112 days after our first meeting and 4,126 road miles from the Dee I am looking at the same bird I saw feeding amongst the pebbles at Thurstaston. I am stunned. 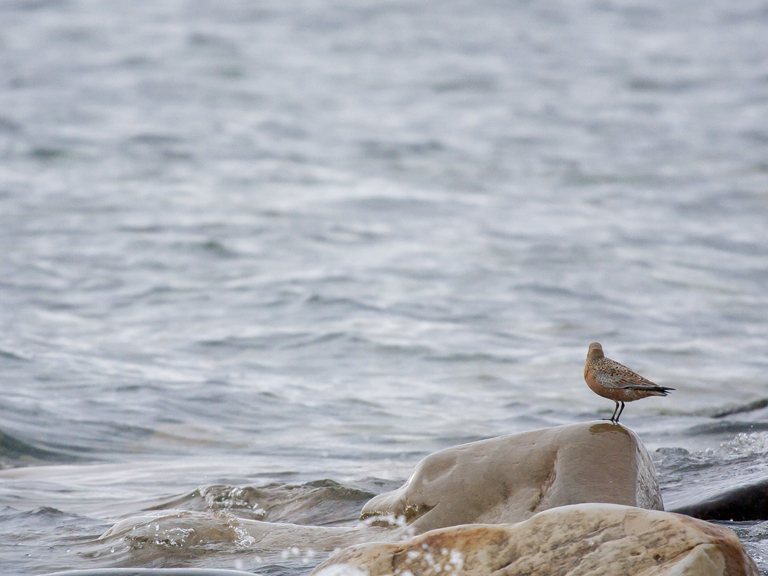 I knew it would be possible to see a Dee bird but I didn't seriously entertain the idea that I'd cross paths with one. It might mean little or nothing to others but it means the world to me. Well, a little piece of the northern hemisphere anyway.